Can we suggest Russian Standard Imperial vodka for breakfast? This morning we had to get up bright and early, because a group tour was scheduled. 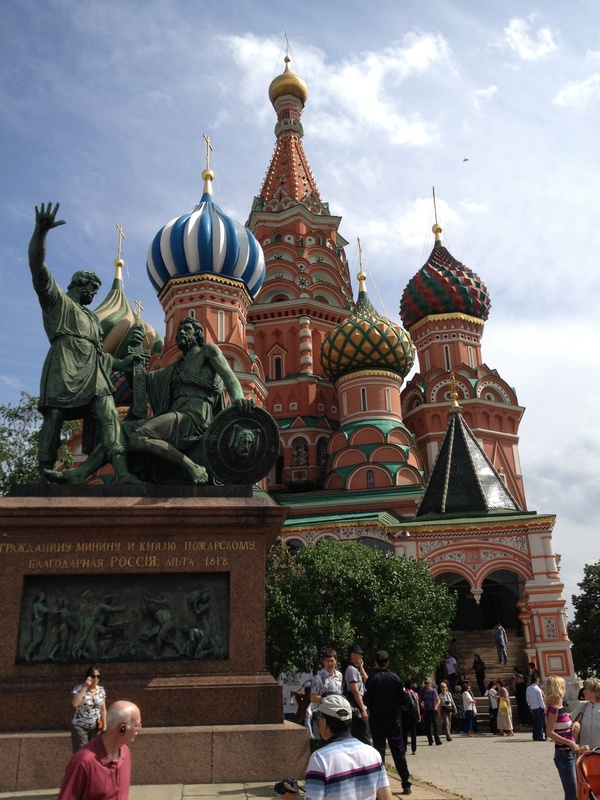 Today, the big event was a tour of the Kremlin. 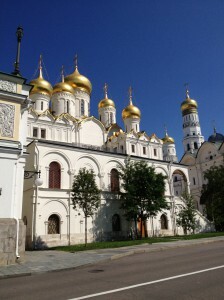 One advantage of using the Exeter tour guides, is that they arranged to enter the Kremlin early, which was especially important since this was a Saturday. The crowds later would be sizeable. 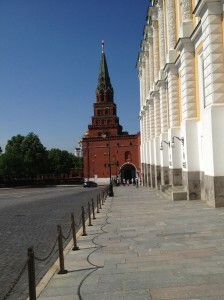 Fortunately, the hotel was within easy walking distance of the Kremlin so we didn’t have to mess with cars or the Metro. The Kremlin was originally built as a citadel (kremlin is Russian for fortress). It contains five palaces and lots of churches, cause when you’re oppressing and ruling (not necessarily in that order) the masses, you probably need to pray to God a lot. I’d like to think that the praying was mostly a lot of, “Oh, God, the Great and Merciful, please keep the serfs from revolting”. So, we saw a bunch of churches. The Orthodox churches are considerably different in their decorative concepts from the Western Catholic houses of worship. Lots less stained glass and marble, lots more plastered and painted surfaces. 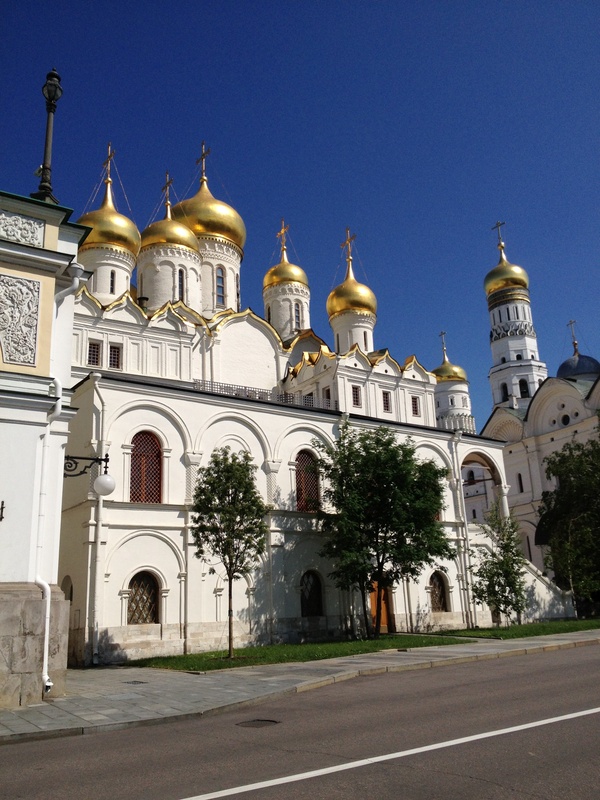 Also, on a one to one basis, the Orthodox cathedrals are significantly smaller than their Western counterparts. Note the lack of crowds at this unearthly hour of the morning. 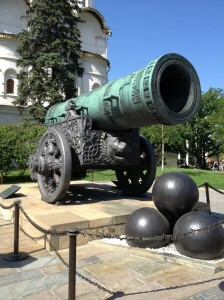 The big draw of the morning, for us, was the Armory Museum inside the Kremlin. This is where an amazing amount of silver and gold tableware, thrones, weapons and armor, carriages, clothing, and regalia can be found. The museum also contains the largest collection of Fabergé Imperial eggs in existence, which really are quite a sight. Again, the presence of an experienced and trained guide was invaluable, as she was able to lead us directly to the highlights of the collections, and give a concise and informative overview of everything we were viewing. By the time we left the Armory the big tour groups had started to arrive and things were getting crowded. Because I just like pictures of big cannons. Also in the Armory is the Diamond Fund, where one can view piles and piles of diamonds of various sizes, as well as gold and platinum nuggets. Mining of gems and precious metals are still a state monopoly in the Russian Federation. Nice, if you like that kind of thing, the piles of diamonds I mean, not the monopoly. Though monopolies are nice too, I suppose, if you happen to be the one holding the monopoly. As a bonus, our time inside the Kremlin intersected with the Changing of the Guard, which was not too dissimilar to the version run in London at Buckingham Palace. More goosestepping though, which looks really hard on the arches. 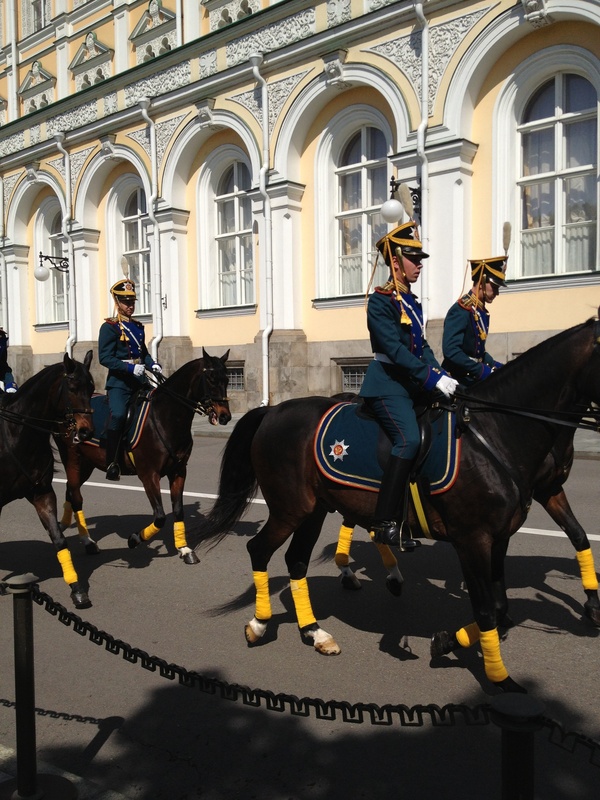 Oh, and lots of rifle twirling and horse prancing, which the tourists adored. Which I suppose, includes us. On the way to the Changing of the Guard. 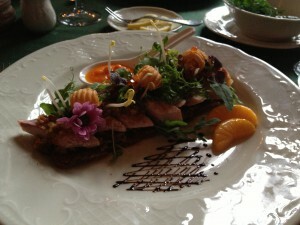 After a full morning in the Kremlin, I was jam-packed to the brim with Russian culture type stuff and hungry. So, when we left the Kremlin and met up with our individual guide, we asked for a break for a bite to eat, some liquids to drink, and a clean restroom. 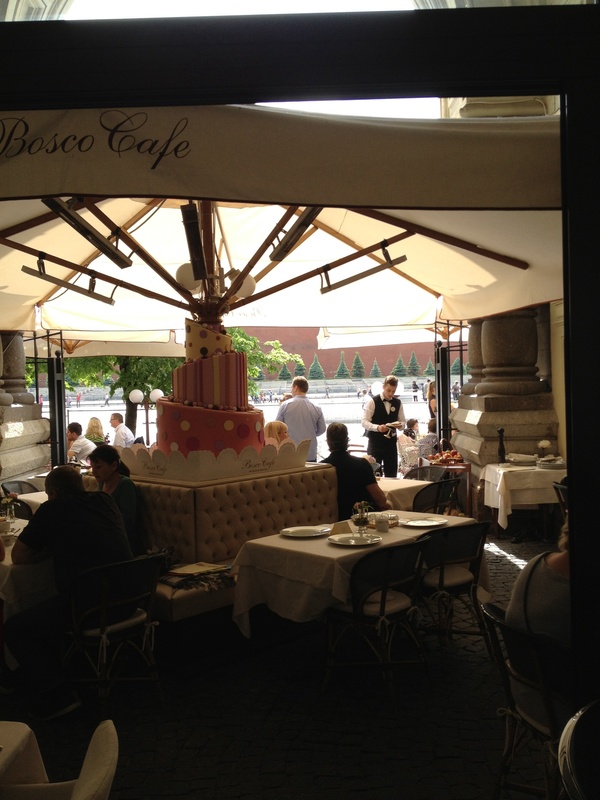 All of our needs were met and exceeded at the Bosco Café which is located right on Red Square. Since the day was sunny and a bit warm, a table outside with a view of the Square seemed appropriate. The meal was adequate to fair, but the real spice was the fact that we were sitting on Red Square itself, sipping a beer while watching the crowds go by. So many years of the military might of the Soviet Union parading through the same location, well, it pretty much blew my mind. Red Square in the background. Not a mobile missile launcher in sight either. After lunch we ducked into the GUM department store building, which is now largely filled with Western luxury brand retail outlets. Very, very expensive retail outlets. We fled rapidly. The previous day our fellow travelers toured Red Square and St. Basil’s Cathedral, while we were off gallivanting about, viewing the CosmoMutts and riding the Metro. So this afternoon, after our alfresco repast, we planned on wandering about both locations with the aid of Anna, our guide. And so we did, and it was pretty great. By the end of the day we were bushed and needed a shower and a few hours of downtime. Not something you see every day in El Paso. Or any day. 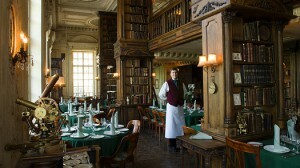 After which, refreshed somewhat, we repaired to Café Pushkin for dinner. The restaurant is a bit of a tourist destination, and you can see why. 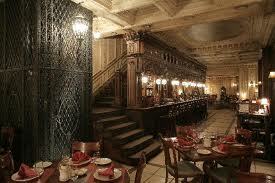 Upstairs, tourist with reservations level. The food was actually quite good. 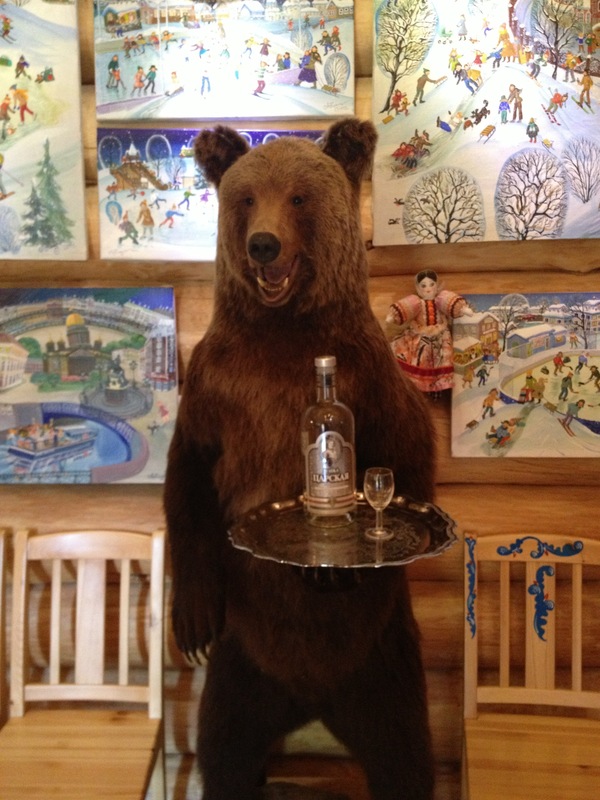 Plus we sampled some Russian Standard Imperial vodka, which I have to say, was very, very excellent indeed. Mary was so taken with her appetizer that she took a picture, or I should say told me to take a picture, which we hardly ever do in restaurants. Mary made me take this, but she did let me have a bite. Finally after a very long day and several small glasses of Russian Standard Imperial, we collapsed into bed, completely dead to the world.